An operation for weight loss or to treat obesity is called a bariatric surgery. Any type of weight-loss surgery has the aim of making changes to the digestive system so that fewer calories are absorbed and sent into the bloodstream. There are two main types of bariatric surgery: Restrictive including gastric banding – where the size of the stomach is restricted either using staples or a band so that only small meals can be eaten. Malabsorptive (Restrictive) including gastric bypass and duodenal switch – where the stomach size is restricted by bypassing part of the digestive system so that food intake is restricted and not all calories are absorbed by the body. It is unlikely that anyone considering weight loss surgery would be able to access this free of charge on the National Health Service (NHS) without being put on a very long waiting list. Prices for private bariatric surgery can range from £5,000 - £9,500 for a gastric band to £8,000 - £15,000 for a gastric bypass. Our bodies need food as a source of energy for any physical activity that we do, this energy is measured in calories. As we eat, our digestive system breaks down the food into energy that can be absorbed by our bloodstream and distributed around the body to be used as fuel by our muscles, organs and other tissues. In order to be healthy, we must all try and balance the amount of calories we consume with the amount of calories that our body burns up. Hence, weight gain, and ultimately obesity, is caused by taking in more calories than we currently use. (There are other medical causes associated with obesity as well). This is why, as well as eating a balanced diet, it is always advisable to exercise so that we are able to burn up these calories, as when we have taken in more calories than we need the body converts this spare energy source into fat and stores it away, meaning that we gain weight. In order to establish whether a person is of a healthy weight, or under or over weight, a Body Mass Index (BMI) calculation is used; which basically compares your height with your weight to make sure that your body mass is of a reasonable level. Why not use the British Obesity Surgery Patient Association website to calculate your BMI here. Normally men should have a BMI of between 20 and 25, and women between 18.5 and 23.6. It is also worth noting that although extra fat storage is the commonest reason for a high BMI score, people who are very fit and muscular, such as body builders will also demonstrate a high BMI due to muscle bulk. A person is categorised as obese if they have a BMI over 30, those with a BMI over 40 are classed as morbidly obese, and those over 50 as super obese. Generally those classed as morbidly obese and above are suitable for bariatric surgery, but cases vary on a person by person basis (see more information below). According to the National Audit Office (NAO) in 2001, who carried out a report entitled “Tackling Obesity in England”, 1 in 5 adults were obese with the number having trebled over the last 20 years, and nearly two thirds of men and one third of women were overweight or obese. Obesity is also linked to the onset of various health problems leading to potential death, with the most common problems associated with obesity including heart disease, type II diabetes, high blood pressure and osteoarthritis, thus causing approximately 30,000 deaths a year and an estimated financial impact on the NHS of £5 billion a year in treatment costs for the associated illnesses. "...by 2010, just over a quarter of adults (26% of both men and women) were obese. A further 42% of men and 32% of women were overweight. The rate of increase in the obese population has slowed, however, from an average 0.9% yearly growth between 1993 and 2002 to an average 0.5% yearly growth between 2002 and 2010. Modelling carried out for the Government Office for Science in 2007 suggested that, if trends continued at the current rates, 60% of men, 50% of women and 25% of under-20-year-olds could be obese by 2050." No major developed nation has so far reversed the upward trend in obesity and the UK as a whole has one of the highest levels of obesity among European countries. The number of cases of weight-loss surgery performed on obese people by the NHS more than doubled between 2006/7 and 2008/09, the same NHS Information Centre report showed. The NHS performed 4,220 bariatric procedures (which include stomach stapling, gastric bypasses and sleeve gastrectomy) on obese people in 2008/09 compared to 1,950 in 2006/07. The figure also represents a 55% increase on 2007/08 when 2,724 obese people underwent such procedures. Bariatric surgery is not always available through the NHS; depending on where you live and your particualr circumstances, you may need to seek treatment through a private clinic. If you are considering bariatric or obesity surgery; the following information will give you a basic understanding of the procedures. It can't answer all your questions, since a lot depends on the individual patient. Please ask a practitioner about anything you don't understand. Who can have Bariatric or Weight Loss Surgery? The National Institute for Health and Clinical Excellence (NICE) published a set of guidelines in 2014 for the NHS on the use of bariatric surgery for the treatment of morbid obesity. (Most private clinics will also adhere to these recommendations). Bariatric surgery is recommended as a treatment option for adults with obesity if all of the following criteria are fulfilled. Firstly a person must be morbidly obese, and in order to be classed as such your BMI should be over 40, or between 35 and 40, with an obesity related disease (such as type 2 diabetes or high blood pressure) which may be improved if you lost weight. All appropriate non-surgical measures have been tried but have failed to achieve or maintain adequate, clinically beneficial weight loss for at least 6 months. The person has been receiving or will receive intensive management in a specialist obesity service. The person is generally fit for anaesthesia and surgery. The person commits to the need for long-term follow-up by a doctor and other healthcare professionals such as dieticians or psychologists. Bariatric surgery is also recommended as a first-line option (instead of lifestyle interventions or drug treatment) for adults with a BMI of more than 50 in whom surgical intervention is considered appropriate. Some clinics will also not operate on people over the age of 60. Before proceeding with bariatric surgery, you will need to make a commitment to permanently change your eating habits and lifestyle otherwise any method of surgery will ultimately fail in the long term. Weight loss surgery in the form of gastric bypass was first developed in America in the 1950s and 60s after weight loss was observed in patients undergoing partial stomach removal due to ulcers. Over the decades the technique used has changed and improved into what is used today. Latterly, procedures using gastric banding were introduced in the late 1970s with various synthetic materials used for the bands, including polyethylene terephthalate (Dacron®), polypropylene (Marlex® Mesh) and polytetrafluoroethylene (Gortex®) during the early 1980s, until adjustable bands using silicone were developed in 1986. Any type of weight-loss surgery has the aim of making changes to the digestive system so that fewer calories are absorbed and sent into the bloodstream. By doing this the body is left with a shortage of calories for what it needs for day-to-day functioning, hence it begins to use up the stores of fat that it has built up over the years. As this fat is used up, the person’s weight will start to fall. Depending on the type of operation, this weight loss can be quite dramatic and quite quick. Eventually the body adapts to it’s new digestive system, and after continued weight loss for 12 – 18 months, weight will begin to stabilise and the calorie intake reflect what the body needs, meaning no shortfall or possibilities of ending up underweight (other than in extremely rare cases). Malabsorptive (Restrictive) – this is where the stomach size is restricted by bypassing part of the digestive system (intestines) so that food intake is restricted and not all calories are absorbed by the body. Forms of restrictive surgery generally practiced in the UK include gastric banding and vertical gastric banding. Forms of malabsorptive (restrictive) surgery include gastric bypass and duodenal switch. What happens during a Weight Loss (Bariatric) operation? Your first discussion with a surgeon should clearly set out your expectations and whether the operation can give you the results you desire. Careful discussions regarding the reasons for wanting a weight loss surgery and your suitability for this type of surgery are very important at this stage. Make sure that you obtain as much information as is necessary to enable you to make a fully informed choice and make sure you receive satisfactory answers to all your questions. A medical history should also be taken to make sure that there are no reasons why you shouldn’t have this operation. You would normally be asked to sign a consent form which means that you have understood the potential benefits and risks associated with weight loss surgery. Photographs and weight measurements will also be taken by the practitioner as a "before and after" comparison at a later date. The surgeon may also wish to write to your G.P. giving details of the operation so that if there are any problems associated with surgery in the short or long-term your doctor is aware of the procedure and can help you to recover. Bariatric surgeries are performed under a general anaesthetic, and can either be performed as an “open” surgery requiring a large incision across the abdomen, or more commonly these days they are done via keyhole, or laparoscopic methods which only need five or six small incisions at various places on the chest and abdomen, through which cameras and surgical instruments are fed. Please take into account that a general anaesthetic carries more potential risks the higher your BMI is and with any obesity related illnesses that you may have – this should be clearly explained by the surgeon before you make any decisions about the type of surgery you are undergoing. If you make a decision to go ahead with bariatric surgery (most likely privately), the actual procedure may take place in a small private hospital or in an NHS hospital as a private patient, as depending on the complexity of your particular operation some surgeons may prefer to be in a larger hospital with specialist care on hand, should they be needed. The time taken to carry out the various weight loss surgeries detailed below depends on the extent of work required by the surgeon, and whether the procedure is carried out openly or laparoscopically (which takes a surgeon longer), and is broken down approximately in the table below. 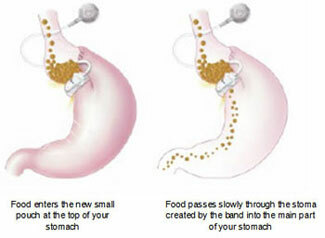 Restrictive procedures, using gastric bands or rings are based on the concept of dividing the stomach into two sections. The top part of the stomach is turned into a small pouch that fills up with food quickly, giving a feeling of fullness. It then empties slowly through the small space (called the stoma), formed by the band, into the rest of the stomach or lower part, before passing normally through the rest of the digestive system. These kinds of surgery restrict the amount of food a person can intake, and it becomes uncomfortable to eat anything more than small meals, with excessive eating tending to cause vomiting and pain. As digestion is not affected these procedures also don’t generally cause vitamin or nutrient deficiencies in the individual. The Laparoscopic Adjustable Gastric Banding (LAGB) procedure is also commonly known by the main brand name for the device utilised in the procedure, the LAP-BAND®. Although, this is the most popular brand, other devices (such as MIDband®) are available which all work in basically the same way. A silicone band lined with an adjustable balloon is secured into a ring shape around the top of the stomach with a locking device at each end of it; this produces the small pouch at the top part of the stomach and the new stoma entrance into the main part of the stomach. The band then has a thin tube attached to it with a reservoir or access port at the end (secured under the skin in the lower chest or abdomen), through which the balloon on the band can be inflated with fluid and therefore tightened to reduce the size of the stoma (gateway to the main stomach) as required. Inflation of the band is usually done a few weeks after the initial operation to fit the device as this gives time for the swelling caused by surgery to subside so a clearer picture of how ‘tight’ the band should be is available. In order to get the amount of inflation needed correctly set, the patient must swallow a liquid called barium which shows up on x-rays, that way a series of x-ray pictures can be taken over time to monitor how quickly the barium flows through the stoma from the created pouch; too fast and you will feel hungry again too quickly when eating food, so the band will need inflating (tightening) and too slow could cause vomiting even when eating small meals, so the band needs deflating. The key advantages of this gastric banding technique are the ability to perform it laparoscopically (by keyhole surgery), and the fact that the band can be adjusted depending on the individual’s weight loss progress post-surgery. If medically necessary, it can also be reversed, with the band being removed and the stomach returning to its original size, as the stomach will not have been surgically altered as with bypass surgery. This type of procedure is best suited to individuals with a BMI below 45. Average weight loss is typically 20-25% of original weight. Vertical gastric banding or vertical banded gastroplasty is sometimes commonly referred to as “stomach stapling”. The size of the stomach is reduced by placing a vertical line of staples along it, creating a small pouch at the top for food intake, whilst a fixed width band or ring is placed at the bottom of this pouch (through a small window hole made in the stomach), to allow the food to slowly move down into the main stomach and be digested. Since the advent of adjustable gastric bands, as described above, and with the side effects often noted from this procedure, such as tearing along the staples, this procedure is rarely performed these days. Malabsorptive surgeries such as gastric bypass have been shown to be the most successful type of weight loss surgery based on the amount of weight lost and are therefore suitable for those classed as super obese and above, with a BMI over 45. Despite this, there are obviously drawbacks in that the operations carry many more risks and complications than restrictive surgeries. Also, due to the nature of the operation, such procedures are not easily reversible. As with the wholly restrictive procedures detailed above, the malabsorptive surgeries can also be carried out as an open operation or laparoscopically. After various technique modifications in the early years of gastric bypass surgery during the 1960s, the most common method used today is known as the Roux-en-Y (RNY) gastric bypass, (pronounced Roo-in-Why). It is named after the French surgeon Dr Phillibart Roux who pioneered the original technique in the 19th Century, which was later perfected for gastric bypass surgery by Dr. Ward Griffin in the late 1970s. The Y refers to the shape created with the rerouting of the small intestine following surgery. The laparoscopic version of RNY gastric bypass was first performed in 1993. According to The American Society of Metabolic and Bariatric Surgery, the RNY gastric bypass is the most commonly performed operation for weight loss in the United States. A small pouch is made at the top of the stomach using a line of staples, effectively separating it completely from the lower section of the stomach. 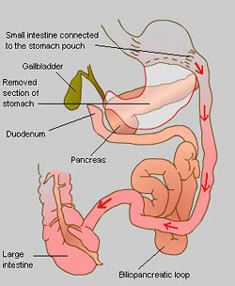 A new opening is then made in this stomach pouch and the small intestine cut into two halves, with the lower portion being brought up and attached to the opening in the new stomach pouch (this is known as the Roux limb section), and the upper portion of intestine which carries digestive juices from the bypassed remainder of the stomach and duodenum (first section of small intestine where digestive juices from the pancreas, liver and gallbladder empty into to break down food) is joined to the Roux limb. 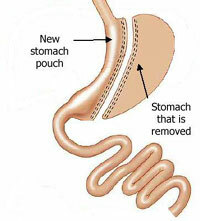 Therefore the small stomach pouch means that the intake of food is reduced and this food now leaves the stomach pouch through the new opening and bypasses the rest of the stomach and some of the small intestine, resulting in fewer calories being absorbed as the food passes through the digestive process. This malabsorption of food doesn’t affect the amount of protein absorbed, but does bypass the area where most calcium, iron and B vitamin absorption takes place so lifelong vitamin and mineral supplements will be recommended to avoid such conditions as anaemia and osteoporosis. Technically this procedure can be considered as both restrictive and malabsorptive as the size of the stomach pouch is reduced, but as the primary function is to limit food absorption by the digestive system, it is often only referred to as simply a malabsorptive technique. Average weight loss is typically 30-50% of original weight. For those classed as super obese or above, the risks involved in surgery are much higher so in order to reduce the amount of time spent under anaesthetic some surgeons choose to do gastric bypass surgeries effectively in two stages. This is done by initially performing a sleeve gastrectomy, which involves reducing the size of the stomach by about 60-75% by dividing it from top to bottom, vertically, using staples (the excess stomach is then removed) to create a smaller banana or sleeve shaped stomach, which functions exactly as the full stomach did, but is much smaller so restricting food intake. At a later date (and when the patient has lost some weight which reduces their surgery risk) this can then be modified with further surgery into an RNY gastric bypass or a duodenal switch (see below). In some cases a person will lose enough weight from the sleeve gastrectomy alone to not need further bypass surgery. A biliopancreatic diversion (BPD), now superseded by the duodenal switch operation (see below), includes a gastrectomy procedure and the bypassing of most of the small intestines, thus combining restrictive and malabsorptive methods for weight loss. First a large section of the stomach is removed via a horizontal gastrectomy, to leave a small remaining top pouch and a sealed duodenum; the small intestine is then cut in two, in much the same way as with an RNY procedure, but much further down. This end section of small intestine is then connected directly to the base of the remaining stomach pouch, thus bypassing the now sealed duodenum, which forms the beginning of the small intestine where bile and digestive juices are mixed with the food. This biliopancreatic loop of intestine which starts with the duodenum is then attached to the small intestine again at a point close to where it meets the large intestine, thus diverting it. A duodenal switch operation is based on and includes the biliopancreatic diversion procedure and works primarily by malabsorption, in conjunction with the inherent restrictiveness of removing part of the stomach. This procedure is not widely performed in the UK. First a large section of the stomach is removed using the sleeve gastrectomy procedure described above, so that a small vertical section remains. This means that the stomach maintains most of its normal functions; unlike with the original biliopancreatic diversion procedure. At the base of the stomach where the small intestine starts, known as the duodenum, a cut is made in the intestine and another is made about half way along it. This lower section of intestine is then brought up to meet the cut end at the duodenum to form the new route for food leaving the stomach – hence the name duodenal switch. The bile and digestive juices in the upper part of the intestine now separated from the stomach and rest of the intestine is known as the biliopancreatic loop and is then sealed off at the top (old duodenum end) and joined to the base on the small intestine just before it meets the large intestine in what’s called the biliopancreatic diversion. The digestion and absorption of fat depends on it mixing with bile from the liver when it enters the duodenum. After a duodenal switch this mixing doesn’t happen until much further on in the intestine, where the biliopancreatic loop joins back again, so the body's ability to digest and absorb calories from fat is very much reduced (even when eating normally). Those who have a duodenal switch operation may therefore be less restricted in what they can eat than a gastric bypass recipient, however this malabsorption of fat does also prevent proper absorption of protein, iron, zinc and vitamins A, D, E and K, hence a very high protein diet and supplements are required ongoing for life. Average weight loss is typically 40-45% of original weight. Although not a bariatric surgery, there are other less invasive methods utilised for weight loss which are worth a mention in this section. Developed in the 1980s, the intragastric balloon (brand name BioEnterics® Intragastric Balloon or BIB®) is designed to provide short-term or temporary weight loss to individuals by the placement of a silicone balloon inside the stomach, using an endoscopic technique, where a tube is fed through your mouth to your stomach which is carried out under heavy sedation. This balloon can then be filled with sterile liquid, thus partially filling up the stomach so that less food is able to be taken in before the sensation of fullness is felt. At this point the balloon is too large to pass through the intestines and simply floats around in the stomach. The maximum recommended time an intragastric balloon can be left in the stomach is 6 months, at which point it needs to be removed, as the risk of deflation due to weakening from the acidic content of the stomach and consequential obstruction of the intestines is greater. (Sometimes you may be prescribed a medication to reduce acid production in the stomach which may prolong the lifetime of the balloon by a short time). For those classed as super obese or above, the risks involved in bariatric surgery are much higher so in order to reduce the amount of time spent under anaesthetic some surgeons choose to use an intragastric balloon to reduce the weight of the patient (and therefore the surgical risk) prior to carrying out any further weight-loss therapies. For those who have significant obesity related health issues and who have failed to maintain weight loss by other controlled methods or who do not fit the criteria for bariatric surgery, but whose illnesses would benefit from weight loss. The intragastric balloon is not designed to be a quick fix and must be used in conjunction with a long-term diet plan and lifestyle changes. Unless there are significant associated health risks it is not recommended for use in those with a BMI below 30. How long will it take to recover from Weight Loss Surgery? All of these weight loss surgeries are considered to be major operations which will require a considerable downtime for recovery post-surgery. Those surgeries performed laparoscopically should heal quicker than open surgeries, due to the smaller nature of the incisions. As well as recovering externally from the surgical incisions, you will generally only be able to eat liquidised food for a period of a few weeks whilst your stomach and ‘insides’ also heal and readjust. A general idea of how long this may be for each surgery is detailed below, but this is dependent on your body’s ability to heal which is different for all individuals. What are the risks and potential complications from Weight Loss Surgery? Bariatric surgery carries risks both during and after the operation, as well as causing long-term problems as your body adjusts to your new “insides”; these include nausea, vomiting, diarrhoea, heartburn and vitamin deficiency, (normally seen with malabsorptive techniques). Like all surgical procedures, there is always a possibility of complications or side effects and, although rare, these can include infection, a reaction to the anaesthesia, blood or fluid collection underneath the skin, nerve damage, blood clots, bowel obstructions and hernias. For those surgeries involving staples or bands, there is a risk of either breaking or bursting at these points, causing leakage which requires immediate corrective surgery, and of ulcers forming in the area(s) around the staples or band. In general, those with more weight prior to any operation are at more risk of suffering complications. Due to this, it may be suggested that some weight is lost first, (either by diet or smaller procedures such as an intragastric balloon), or that special diets are prescribed to shrink the fat around the liver to reduce complications and increase accessibility of the area during surgery. Gastric band operations will also require you to attend one or two follow up sessions with your surgeon for band adjusting after the initial operation. As mentioned, the malabsorptive techniques such as gastric bypass (RNY) and duodenal switch (biliopancreatic diversion) often cause deficiencies in certains vitamins, minerals and nutrients, meaning that you are very likely to require supplements of these, as well as a diet high in certain components for the rest of your life. Restrictive methods, such as gastric bands do not generally cause such problems. Another point to note is that the rapid loss of weight, either by diet or surgery can increase the risk of the development of gallstones. For this reason, the gallbladder, a non-essential organ, may be removed at the same time as a gastric bypass procedure is performed. Alternatively, drugs will be prescribed to try and prevent gallstones from forming. For those considering a duodenal switch operation, approximately 3 in 10 people are said to suffer post-operatively from what can only be described as very smelly and offensive wind and stools, with some regularly suffering from diarrhoea. This is caused by the undigested fat in the lower part of the digestive system, and due to a change in the normal balance of bacteria in the intestines following the procedure. A low fat diet can minimise this problem, along with antibiotics. Another side effect noted with gastric bypass surgery and biliopancreatic diversion (although not when done in conjunction with a duodenal switch) is called dumping syndrome. Due to the way in which the duodenum and beginning of the small intestine is bypassed in these surgeries it means that a valve that regulates the speed with which food from the stomach is released into the intestines is also bypassed. This means that the energy in food gets into the bloodstream much quicker than normal as there is no longer a mechanism to regulate it. Therefore if you eat a large amount of sugary food (such as sweet things or highly processed food products), this sugar passes very quickly into the bloodstream, causing the body (pancreas) to over produce insulin, a hormone that helps the body to utilise any sugar it intakes. Thus symptoms of this dumping syndrome include dizziness, a light-headed feeling, cold sweats, heart palpitations, a feeling of “butterflies” in the stomach and nausea. Normally a person will want to lie down for half an hour until symptoms fade and then diarrhoea may follow. Hence, this side effect can in fact act as a deterrent to over-eating of the wrong types of foods which may previously have been a compounding factor in the original obesity; therefore many gastric bypass patients lose their sweet tooth very quickly due to this side effect. Another factor to consider with the rapid weight loss experienced with many bariatric surgeries is that the skin, which has previously been stretched by any weight gain, may simply not be able to shrink back enough with the weight loss, meaning that you can be left with baggy sections of skin in the years following bariatric surgery. Typically this is found around the stomach, thighs, buttocks, underside of the upper arms and in women, in the breasts. There are many body contouring surgeries available now to reduce this excess skin, such as lower body lift, abdominoplasty (tummy tuck), thigh lift, buttock lift, brachioplasty (upper arm lift) and mastopexy (breast lift); but in general you should give your body plenty of time post bariatric surgery, until you are at a stable point in your weight loss and skin reshaping, before you consider such follow-up procedures which do require painful and extensive surgery. What should you do after a Bariatric operation? It is very important that you follow the advice of your surgeon carefully after bariatric surgery. avoiding high sugar foods or processed foods in case of dumping syndrome. Who can perform Bariatric surgery? Only fully trained and qualified surgeons should perform bariatric (weight loss) surgery. As this is such a specialised field, it is important to consider the experience of your surgeon, in terms of the number, type and method (keyhole or open) of procedures that he has performed. For more information about practitioner training, qualifications and relevant medical organisations please view the information contained within the Legislation section of the Consulting Room. Is Weight Loss Surgery available on the NHS? It is unlikely that anyone considering weight loss surgery would be able to access this free of charge on the National Health Service without being put on a very long waiting list (2 – 3 years), as the NHS has little funds for such operations unless there is an additional serious health problem associated with the obesity. However, certain regions do make special cases and we would always recommend that you visit your General Practitioner before embarking upon a major procedure. As well as their advice and guidance they may also be able to refer you to a local NHS Hospital who can treat you. "To qualify for surgery on the NHS you must meet specific criteria as set out by your local health authority. The NHS will not pay for surgery for cosmetic reasons alone. Reconstructive and cosmetic surgery to correct, or improve, congenital abnormalities and injuries will usually be carried out free of charge. NHS reconstructive surgery is performed by plastic surgeons who have had extensive training and belong to the British Association of Plastic Reconstructive and Aesthetic Surgeons. Surgeons who carry out cosmetic surgery through the NHS also belong to the British Association of Aesthetic Plastic Surgeons. To receive cosmetic surgery from the NHS, you will normally need a referral from your GP. You will have a consultation with a plastic surgeon and an assessment by a psychiatrist, or psychologist. It will then be decided whether there is enough social, psychological, or physical benefit to be gained to justify surgery." What is the average cost of Weight Loss Surgery? Prices for private bariatric surgery can vary according to the type of operation and can range from £5,000 - £9,500 for a gastric band procedure to £8,000 - £15,000 for a gastric bypass procedure, depending on the complexity of surgery required for your size. Intragastric balloon procedures, which include fees for insertion and removal, range from £4,000 -£8,000. Remember of course that you may want further surgery, a few years post bariatric, for the removal of excess skin left after the weight loss, so be prepared to budget for an additional £3,000 - £6,000 of surgery. Choosing to pursue weight loss or bariatric surgery is a life changing decision. Although the type of surgery recommended by your surgeon is an important component in determining the amount of weight you may lose, so is your own willingness to make serious lifestyle and eating habit changes, so that the surgery doesn’t fail making the weight loss not as good as expected. There have been some good clinical studies done comparing the different types of surgery; however there is still only limited data on the long-term (over 10 years) outcomes of the differing procedures which makes it difficult for surgeons to be sure about which procedure is best for you. The degree of weight loss required? How quickly the weight loss is required? Your current eating behaviours? Sweet eater? Speed eater? Large portion eater? Your personality? Your will/sticking power? Ability to cope with lifestyle and image changes? For more information and advice, including interaction with other people who have had bariatric surgery, please visit the British Obesity Surgery Patient Association website. Please note that we currently do not feature real "before and after" images of patients who undergo elective weight loss surgery. Results vary enormously depending upon both the patient, the type of procedure performed and the skill of the individual surgeon. Click for ALL Bariatric (Weight-Loss) Surgery clinics in the UK & Ireland registered and verified by Consulting Room. People thinking of having a cosmetic procedure are being urged to question their doctors before going ahead with treatment, in new advice issued on 1st June by the General Medical Council (GMC).